Michael Kontraros, master sculptor, mentor, teacher and creator of bespoke, one off award winning projects is currently running a crowdfunding campaign with the main goal being to get his students works published within our hobby. He treated these unique sculpts as if they were his own works and they arrived in their distinctive metal tins adorned with the boxart of each of the different sculpts. These are one or two part, traditional sculpts, consisting predominantly of head and shoulders cast in polyurethane resin. “During sculpting lessons and with guidance from myself, four students created their own 200mm busts. Anthony Contorinis, Marios Vrachiolidis, Spyros Paizakis and Nikos Rovakis, did their best to bring the learning process to life. These busts were expertly painted by Masters like Ben Komets (on Nosferatu) and Francesco Farabi (on The Knockout) and experienced painters like Alex Aggelakis (on Major Pain) and Kostas Synodinos (on Brock the Orc). This developed into an important project as apart from sculpting students and professional painters they are all very good friends. The support and contribution from our awesome community is very important in order for the whole idea to be realised and for the sculpts to be molded, copied, packaged and released”. Each sculpt was created under the supervision and/or during workshops with Michael and each part of this eclectic collection is sculpted with an innocence and character that you don’t always get with the professionals. Each student has brought their relative project to life with humour, revulsion, aggression and beauty, each telling it’s own story and offering the painter and collector something totally different to the others. 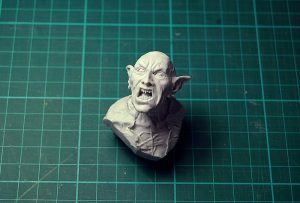 Nosferatu is a sculpt full of feral, snarling rage and bloodlust, displaying nice textures to the skin including wrinkles, veins and runic scarification to the chest. The garment he wears fits in with his primal visage, being worn and tattered. The box art by Ben Komets brings it to life and shows what can be achieved. Next up we have Major Pain, an armoured and lethal femme fatale from the near future equipped with a shoulder mounted targeting system and weapon. The bust shows nice volumes and anatomy and enough variation in the various elements to make the body armour interesting to paint. The face shows that the sculptors confidence continues to grow depicting a female that is both handsome and dangerous with high cheek bones, full lips and a steely gaze. My favourite of the four sculpts is The Knockout sculpted by my buddy Ant Con with box art painted by my master Francesco Farabi! This is a two part bust and shows an understanding of volumes and anatomy and some considerable consideration was put into how the glove would “attach” to the face to best show the moment of impact. 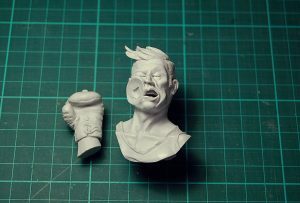 The muscles and tissues of the face are perfectly captured during the moment of the knockout punch! There is a wonderful sense of humour to the piece and Francesco’s boxart captures it perfectly. However, there is so much more to this bust, with excellent anatomy, details and textures. Last but by no means least we have Brock the Orc. This is a raw sculpt capturing the ugliness and brutal savagery of the war mongering Orc. Sculpted by Nikos, the bust boasts excellent textures and volumes with attention in particular being given to create an overall piece that tells the story of an Orc warrior. It is a traditional bust in every sense of the word as it comprises of just head and shoulders. The head being perfectly framed by the fur collar, further more the vertical straps for the armour can act as a way of guiding your eye up to the face if and when painted correctly. The facial features are savage and snarling and will offer the painter quite the canvas to try various effects including textures, scars and cuts. Overall I think each of the students should be very pleased with their efforts and it is this sort of incentive that the community should get behind and support if we are wanting to see the emergence of the next Romain van den Bogaert or Allan Carrasco! Don’t forget you can also purchase “Goblin in Love” sculpted by Michael Kontraros himself, although Michael reiterated to me that this was ultimately about his students so I won’t go in to that particular bust any further. You will see though that it is part of the Indiegogo campaign. We basically have a choice of five busts, all with their own attractive traits, each telling it’s own story. In addition, it is an opportunity to help support a group of students develop their skills and achieve their dreams of having their work cast in resin. Each of these busts could also be considered a transitional project for any painter who wishes to try his hand at painting his first bust. The sculpts, composition and size all indicate a project that could be straightforward and a lot of fun to paint! Follow this LINK and choose your pledge. 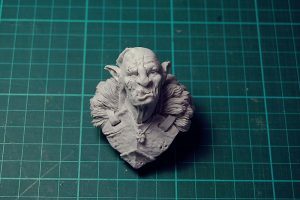 Each bust costs €34 apart from Goblin in Love which costs €39, shipping is included in the price! You can also receive ALL of the busts at a discounted rate too. One of the best things about this campaign is that Michael is ready to go straight away and shipping is expected in October of this year! Please support this project! It is a great incentive and the sculpts are very nice too!